I don't actually like this movie all that much, but I've returned to it dozens of times because Frank Sinatra's performance is SO good, and I love his character SO much that the rest of the movie doesn't even matter to me. Watching this just brought back so many memories of when I first fell in love with Frank Sinatra, and classic movies in general. I used to have a flip-phone in high school that let you set a video clip as your background wallpaper, and I spent way more time than I should admit trying to record a perfect 5-second clip of Frank Sinatra turning around in the door, when Barney Sloane enters the movie and we get our first glimpse of that skinny little world weary curmudgeon. I remember before the internet made everything so easy I had a micro-cassette recorder that I used to tape the songs from the movie, resting the microphone in front of the TV speakers and making everyone in the house be quiet while I was recording. I memorized his "convention of angels" speech when I was 14 and I was shocked when I watched it today and realized I still knew all the words. "Your story's all cockeyed baby." Barney Sloane was, and still is, FOR SOME REASON, my ideal. 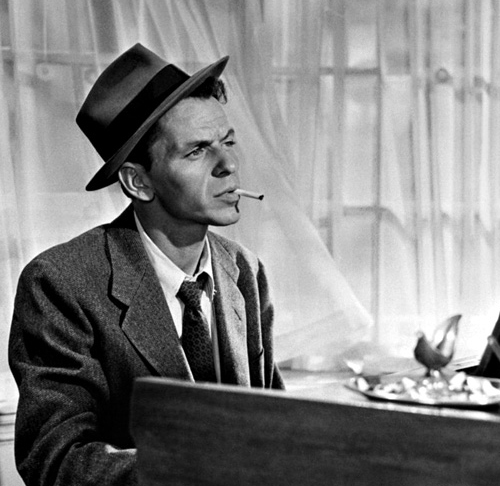 I remember listening to his bit about hard luck and not having eaten food since yesterday afternoon, his tie always at half mast, his creaseless pants (even though creases are "constitutional") a cigarette limply dangling from his mouth, the way he says "at all" with such Sinatra-like enunciation, and feeling an overwhelming connection to the character. I wanted to love him, to be him, to know him, I don't even know. But watching it today I felt the same indescribable feeling. Maybe watching this film so much as a teenager created an unbreakable bond between the character and my teenage self and whoever I am now. I feel more like Barney Sloane now than I ever did then. Maybe Barney Sloane helped shape me into another bleak world-weary curmudgeon (not so skinny though, dammit) or maybe that ill defined connection I felt as a kid was some kind of kinship with the person I'd become. Anyway. Whatever the reason, Barney Sloane was, is, and always will be an incredibly relatable character for me and I'm sure I will put up with Doris Day's irrepressible goddamn chipper spirit many, many more times for years to come. 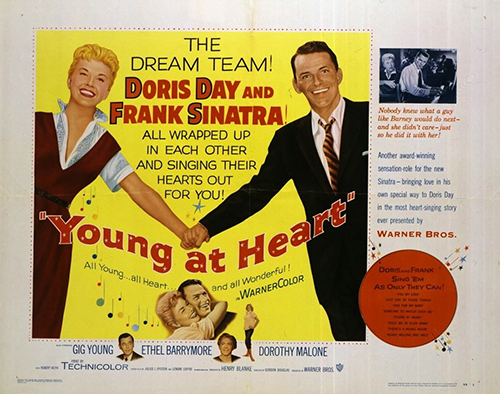 I quite like this movie, mostly for Sinatra, though I'm a Doris Day fan as well. I haven't seen it in years though, and you're making me want to hunt up my old recorded-off-AMC video copy. And see if I could find it on DVD. My brother and I used to record all our favorite songs from movies with my cassette recorder! We'd wait for our parents to leave, hang a piece of paper that said, "Quiet on the set!" on the door to warn them not to come home unexpectedly, and then start recording. Good, good times. But anyway, how intriguing that this character impacted you so deeply! I have some like that too, especially from those teen years, that just wove themselves into the fabric of my being.